1) The paper facilitates an understanding of how the cadastral concept has evolved over time into the broader concept of Land Administration Systems in support of sound Land Governance. The role of land professionals and FIG is underlined in this regard. The paper also represents the essence of a range of papers presented by the author as President of FIG over the term of office 2007-2010. In most countries, the cadastral system is just taken for granted, while the impact of the system in terms of facilitating an efficient land market and supporting effective land-use administration is not fully recognised. The reality is that the impact of a well-functioning cadastral system can hardly be overestimated. A well-tailored cadastral system is in fact acting as a backbone in society. The famous Peruvian economist Hernando de Soto has put it this way: “Civilized living in market economies is not simply due to greater prosperity but to the order that formalized property rights bring” (De Soto, 1993). The point is that the cadastral system provides security of property rights. The cadastral systems thereby paves the way for prosperity – provided that the basic land policies are implemented to govern the basic land issues, and provided that sound institutions are in place to secure good governance of all issues related to land and property. This institutional context is of course country unique. Since the early 1990´s there has been a major evolution in this area of land administration. FIG has played a significant role in terms of facilitating the understanding of the role of land administration, and by establishing a powerful link between appropriate land administration and sustainable development. Throughout the world, the cadastral concept has developed significantly over the past few decades. The most recent examples are current world concerns of environmental management, sustainable development and social justice. The human kind to land relationship is dynamic and is changing over time as a response to general trends in societal development. In the same way, the role of the cadastral systems is changing over time, as the systems underpin these societal development trends. In the Western world this dynamic interaction may be described in four phases as shown in figure 1 below. Over the last few decades land is increasingly seen as a community scarce resource. The role of the cadastral systems has then evolved to be serving the need for comprehensive information regarding the combination of land-use and property issues. New information technology provides the basis for this evolution. This forms the new role of the cadastral systems: the multi-purpose cadastre. The international development in the area of Cadastre and Land Administration has been remarkable with FIG taking a leading role. Throughout the last 10-15 years a number of initiatives have been taken with a focus to explain the importance of sound land administration systems as a basis for achieving “the triple bottom line” in terms of economic, social and environmental sustainability. International organizations such as UN, FAO, HABITAT and especially the World Bank have been key partners in this process. The International Federation of Surveyors (FIG, 1995) defines a cadastre as a “parcel based and up-to-date land information system containing a record of interests in land (e.g. rights, restrictions and responsibilities). It usually includes a geometric description of land parcels linked to other records describing the nature of the interests, ownership or control of those interests, and often the value of the parcel and its improvements. It may be established for fiscal purposes (valuation and taxation), legal purposes (conveyancing), to assist in the management of land and land-use control (planning and administration), and enables sustainable development and environmental improvement”. A rage of publications is presented below showing the impact of the FIG agenda. 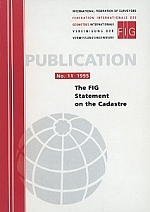 In 1995 FIG published an important and very timely publication entitled “The FIG statement on the Cadastre”. In many countries throughout the world the cadastral systems were revised, mainly due to technology development. Cadastral reform was on the agenda in most developing countries. At the same time, there was also an increasing focus on the cadastral systems in Eastern Europe – the so-called countries in transition. And in the third world there was an increasing awareness about the importance of these systems as a basis for developing a modern and market oriented society. The FIG Statement on the Cadastre, this way, established a standard. The concepts were explained, settled, and made operational according to the specific conditions in different parts of the world. The co-operation between FIG and the UN-organizations was strongly intensified through the second half of the 1990´s. 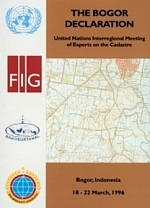 The so-called Bogor Declaration is a good example as a result of an interregional meeting of cadastral experts held in Bogor, Indonesia, March 1996. The Bogor meeting was based on a recommendation from the UNRCC-AP Conference in Beijing in 1994. The meeting was also part of the efforts to develop an active response to the problems of land management and environmental protection as stipulated in Agenda 21 from “The Earth Summit” in Brazil 1992. The cadastral systems were hereby officially recognized for the first time as a core part of the infrastructure supporting a sustainable environmental and nature resource management. The Bathurst Conference was organized by FIG Commission 7 and attracted 40 invited experts from 23 countries. Half of the participants were surveyors from FIG, the other half experts from other professions and representatives from UN organizations such as UNDP, FAO, UN-HABITAT and the World Bank. The Bathurst conference examined the major issues relevant to strengthening land policies, institutions and infrastructures. 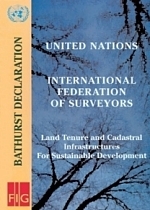 The resulting Bathurst Declaration on Land Tenure and Cadastral Infrastructures for Sustainable Development established a powerful link between good land administration and sustainable development and provided a range of recommendations on how land tenures and land administration infrastructures should evolve to meet the challenges of upcoming 21st Century. The cadastral systems differ throughout the world in terms of purpose, content and design and the technical and economic effectiveness vary a lot. There was a need for a vision for future cadastral systems to fulfil a multipurpose role and in response to technology development. “Cadastre 2014” presented such a vision in terms of six statements for development of cadastral systems over the following years towards 2014. The vision is based on a fully digital environment and using privatisation and cost recovery as the core organisational components. This publication of FIG Commission 7 has obtained remarkable international attention and established a new agenda for discussing the cadastral issues. The publication is translated into a range of foreign languages. In the Western cultures it would be hard to imagine a society without having property rights as a basic driver for development and economic growth. Property is not only an economic asset. Secure property rights provide a sense of identity and belonging that goes far beyond and underpins the values of democracy and human freedom. Historically, however, land rights evolved to give incentives for maintaining soil fertility, making land-related investments, and managing natural resources sustainably. Therefore, property rights are normally managed well in modern economies. The main rights are ownership and long term leasehold. These rights are typically managed through the cadastral/land registration systems developed over centuries. Other rights such as easements and mortgage are often included in the registration systems. 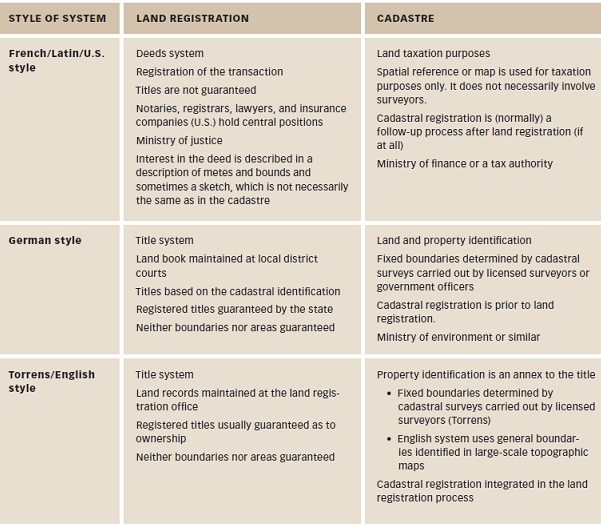 Cadastral Systems are organized in different ways throughout the world, especially with regard to the Land Registration component (figure 2). Basically, two types of systems can be identified: the Deeds System and the Title System. The differences between the two concepts relate to the cultural development and judicial setting of the country. The key difference is found in whether only the transaction is recorded (the Deeds System) or the title itself is recorded and secured (the Title System). The Deeds System is basically a register of owners focusing on “who owns what” while the Title System is a register of properties presenting “what is owned by whom”. The cultural and judicial aspects relate to whether a country is based on Roman law (Deeds Systems) or Germanic or common-Anglo law (Title Systems). This of course also relates to the history of colonization. International experience suggests three basic approaches to cadastral systems. These approaches are based on countries grouped according to their similar background and legal contexts (German style, Torrens/English approach, and French/Latin style). While each system has its own unique characteristics, most cadastres can be grouped under one of these three approaches. Just as there are three different styles of land registration systems, these translate to three different roles that the cadastre plays in each system. Again, while the role of the cadastre and the land registration styles are not definitive, figure 3 describes the three approaches in general terms. Figure 3. General relationships between land registries and cadastres. Modern land administration theory acknowledges the history of the cadastre as a central tool of government infrastructure and highlights its central role in implementing the land management paradigm. However, given the difficulty of finding a definition that suits every version it makes sense to talk about cadastral systems rather than just cadastres (figure 4). These systems incorporate both the identification of land parcels and the registration of land rights. They support the valuation and taxation of land and property, as well as the administration of present and possible future uses of land. Multipurpose cadastral systems support the four functions of land tenure, value, use, and development to deliver sustainable development. By around 2000, cadastral systems were seen as a multipurpose engine of government operating best when they served and integrated administrative functions in land tenure, value, use, and development and focused on delivering sustainable land management. A mature multipurpose cadastral system could even be considered a land administration system in itself. 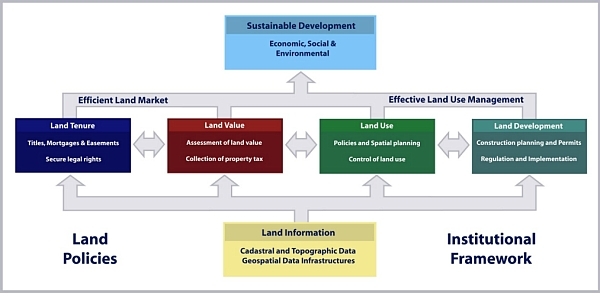 Figure 4: Cadastral systems provide a basic land information infrastructure for running the interrelated systems within the areas of Land Tenure, Land Value, and Land Use (Enemark, 2004). 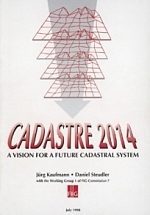 A website has been established http://www.cadastraltemplate.org to compare cadastral systems on a worldwide basis. About 42 countries are currently included (August 2010) and the number is still increasing. The web site is established by Working Group 3 (Cadastre) of the PCGI-AP (Permanent Committee on GIS Infrastructure for Asia and the Pacific). The cadastral template is basically a standard form to be completed by cadastral organizations presenting their national cadastral system. The aim is to understand the role that a cadastre plays in a state or a National Spatial Data Infrastructure (NSDI), and to compare best practice as a basis for improving cadastres as a key component of NSDIs. The project is carried out in collaboration with FIG Commission 7 (Cadastre and Land Management), which has extensive experience in comparative cadastral studies. (Steudler, et.al. 2004). It is generally accepted, however, that a good property system is a system where people in general can participate in the land market having a widespread ownership where everybody can make transactions and have access to registration. The infrastructure supporting transactions must be simple, fast, cheap, reliable, and free of corruption. It is estimated that only 25-30 countries in the world apply to these criteria. It is recognized that these legal or formal systems do not serve the millions of people whose tenures are predominantly social rather than legal. “Rights such as freehold and registered leasehold, and the conventional cadastral and land registration systems, and the way they are presently structured, cannot supply security of tenure to the vast majority of the low income groups and/or deal quickly enough with the scale of urban problems. Innovative approaches need to be developed” (UN- HABITAT 2003). This should include a “scaling up approach” that include a range of steps from informal to more formalised land rights. This process does not mean that the all societies will necessarily develop into freehold tenure systems. Figure 5 shows a continuum of land rights where each step in the process can be formalised, with registered freeholds offering a stronger protection, than at earlier stages. Figure 5. Continuum of land rights (UN-Habitat, 2008). Most developing countries have less than 30 per cent cadastral coverage. This means that over 70 per cent of the land in many countries is generally outside the land register. This has caused enormous problems for example in cities, where over one billion people live in slums without proper water, sanitation, community facilities, security of tenure or quality of life. This has also caused problems for countries with regard to food security and rural land management issues. The security of tenure of people in these areas relies on forms of tenure different from individual freehold. Most off register rights and claims are based on social tenures. The Global Land Tool Network (GLTN), facilitated by UN-HABITAT is a coalition of international partners (such as FIG) who has taken up this challenge and is supporting the development of pro-poor land management tools, to address the technical gaps associated with unregistered land, the upgrading of slums, and urban and rural land management. GLTN partners support a continuum of land rights (figure 5), which include documented as well as undocumented land rights, from individuals and groups, and in slums which are legal as well as illegal and informal. This range of rights generally cannot be described relative to a parcel, and therefore new forms of spatial units are needed. 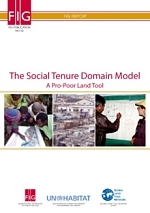 A model has been developed to accommodate these social tenures, termed the Social Tenure Domain Model (STDM). A first prototype of STDM is available. This is a pro-poor land information management system that can be used to support the land administration of the poor in urban and rural areas, which can also be linked to the cadastral system in order that all information can be integrated. The need for a complete coverage of all land by Land Administration Systems is urgent. Not only for the registration of formal rights and for the recordation of informal and customary rights. Also for managing the value, the use of land and land development plans. This relates to the global land administration perspective presented in Figure 6 below. Complete coverage of all land in a Land Administration System is only possible with an extendable and flexible model such as STDM that enables inclusion of all land and all people within the four land administration functions. So STDM will close part of the technical gap in developing countries in terms of making Land Administration cover the total territory. The FIG Working Group 7.1 of Commission 7 on Cadastre and Land Management took the lead from 2002 onwards, in the development of the STDM in close co-operation with UN-HABITAT. ITC, financially supported by the GLTN, developed a first prototype of STDM that is supported by the World Bank. The FIG Publication 52 presents the need for STDM, the properties of STDM as a tool, and the benefit and use of STDM as a key means of meeting the Millennium Development Goals (MDGs). Land tenure types, which are not based on formal cadastral parcels and which are not registered, require new forms of land administration systems. STDM is a pro-poor land tool aiming to include informal land rights into flexible, unconventional systems of land administration that eventually can be incorporated into more formal systems. When countries in Eastern and Central Europe changed from command economies to market economies in the early 1990s, the UN Economic Commission for Europe (UNECE) saw the need to establish the Meeting of Officials on Land Administration (MOLA). 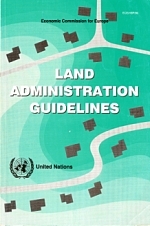 In 1996, MOLA produced Land Administration Guidelines (UN-ECE 1996) as one of its many initiatives. In 1999, MOLA became the UN-ECE Working Party on Land Administration (WPLA). The UN-ECE Guidelines on Land Administration was sensitive to there being too many strongly hold views in Europe of what constituted a cadastre. Another term was needed to describe these land-related activities. It was recognized that any initiatives that primarily focused on improving the operation of land markets had to take a broader perspective to include planning or land use as well as land tax and valuation issues. As a result, the publication replaced “cadastre” with the term “land administration”. Widening the concept of a cadastre to include land administration reflected its variety of uses throughout the world and established a globally inclusive framework for the discipline. An updated version of the guidelines was published in 2005: “Land administration in the UNECE region: Development trends and main principles”. For the first time, efforts to reform developing countries, to assist countries in economic transition from a command to a market-driven economy, and to help developed countries improve LAS could all be approached from a single disciplinary standpoint, at least in theory. That is, to manage land and resources “from a broad perspective rather than to deal with the tenure, value, and use of land in isolation” (Dale and McLaughlin 1999, preface). Consolidation of land administration as a discipline in the 1990s reflected the introduction of computers and their capacity to reorganize land information. UN-ECE viewed land administration as referring to “the processes of determining, recording, and disseminating information about the ownership, value, and use of land, when implementing land management policies” (UN-ECE 1996) The emphasis on information management served to focus land administration systems on information for policy makers, reflecting the computerization of land administration agencies after the 1970s. The focus on information remains but the need to address land management issues systematically pushes the design of land administration systems (LAS) toward an enabling infrastructure for implementing land policies and land management strategies in support of sustainable development. In simple terms, the information approach needs to be replaced by a model capable of assisting design of new or reorganized land administration systems to perform the broader and integrated functions now required. Such a global perspective is presented in figure 6 below. Land management covers all activities associated with the management of land and natural resources that are required to fulfil political and social objectives and achieve sustainable development. The operational component of the concept is the range of land administration functions that include the areas of land tenure, land value; land use; and land development. The four land administration functions (land tenure, land value, land use, and land development) are different in their professional focus, and are normally undertaken by a mix of professionals, including surveyors, engineers, lawyers, valuers, land economists, planners, and developers. Furthermore, the actual processes of land valuation and taxation, as well as the actual land-use planning processes, are often not considered part of land administration activities. However, even if land administration is traditionally centred on cadastral activities in relation to land tenure and land information management, modern land administration systems designed as described in figure 6 deliver an essential infrastructure and encourage integration of the four functions:. Land Tenure: the allocation and security of rights in lands; the legal surveys of boundaries; the transfer of property through sale or lease; and the management and adjudication of disputes regarding rights and boundaries. Land Value: the assessment of the value of land and properties; the gathering of revenues through taxation; and the management and adjudication of land valuation and taxation disputes. Land-Use: the control of land-use through adoption of planning policies and land-use regulations at various government levels; the enforcement of land-use regulations; and the management and adjudication of conflicts regarding land-use and natural resources. From this global perspective, land administration systems act within adopted land policies that define the legal regulatory pattern for dealing with land issues. They also act within an institutional framework that imposes mandates and responsibilities on the various agencies and organisations. LAS designed this way forms a backbone for society and is essential for good governance because it delivers detailed information and reliable administration of land from the basic foundational level of individual land parcels to the national level of policy implementation. FIG is strongly committed to the Millennium Development Goals and the UN-Habitat agenda on the Global Land Tool Network. FIG should identify their role in this process and spell out the areas where the global surveying profession can make a significant contribution. Issues such as tenure security, pro-poor land management, and good governance in land administration are all key issues to be advocated in the process of reaching the goals. Measures such as capacity assessment, institutional development and human resource development are all key tools in this regard. In pursuing this agenda FIG is working closely with the UN agencies and the World Bank in merging our efforts of contributing to the implementation of the MDGs. This provides a platform for focusing on specific issues of mutual interest such as taking the land administration agenda forward. At the same time it will contribute further to the well founded cooperation between FIG and our UN partners. In recent years FIG has established a number of relevant initiatives. A rage of publications is presented below showing the impact of the FIG agenda. Following the Bathurst Declaration in 1999 a number of FIG initiatives looked at addressing the goal of the global agenda namely sustainable development. FIG published a policy statement in 2001 on FIG Agenda 21 (FUG pub. 23) and a report with guidelines on Women´s access to land with some key principles for equitable gender inclusion in land administration (FIG pub. 24). Sustainable development was also in focus in the Nairobi Statement on Spatial Information for Sustainable Development (FIG pub. 30) and the following best practice guidelines on city-wide land information management (FIG pub. 31) both published as an outcome of 1st FIG regional conference in Nairobi 2002. The concept of organising regional conferences has proven to be strong by bringing FIG to various regions in the world especially developing countries and providing a unique opportunity to address issues at the top of the regional and local agenda. The resulting FIG publications include: The Marrakech Declaration on Urban-Rural Development for Sustainable Development (FIG pub. 33, 2004); The Costa Rica Declaration on Pro-Poor Coastal Zone Management (FIG pub. 43, 2008); and the Hanoi Declaration on Land Acquisition in Emerging Economies (FIG pub. 51, 2010). A pro-poor approach to land administration and management has been addressing through the report on Informal Settlements – The Road towards more Sustainable Places (FIG pub. 42, 2008) and the comprehensive report on Improving Slum Conditions through Innovative Financing (FIG pub. 44, 2008) produced as an outcome of the joint FIG/UN-Habitat seminar during the FIG Working Week in Stockholm, June 2008. The pro-poor approach has been further addressed through development of the Social Tenure Domain Model (FIG pub. 52, 2010) in cooperation with GLTN, UN-Habitat. The big challenges on the global agenda such as climate change, natural disasters, and rapid urban growth have been addressed in The Contribution of the Surveying Profession to Disaster Risk Management (FIG pub. 38, 2006) and the research study on Rapid urbanisation and Mega Cities: The Need for Spatial Information management (FIG pub. 48, 2010). The overall challenge of Good Land Governance in support of the global agenda has been analysed in cooperation with the UN-agencies and the World Bank. Key outcomes have been the Aguascalientes Statement on Development of Land Information Policies in the Americas (FIG pub. 34, 2005) and the very recent key publication on Land Governance in Support of the Millennium Development Goals (FIG pub. 45, 2010) resulting from the joint FIG/World Bank conference held in Washington, March 2009. Based on this conference the World Bank has also published a joint WB/FIG/GLTN/FAO publication “Innovations in Land Rights Recognition, Administration and Governance”. All countries have to deal with the management of land. They have to deal with the four functions of land tenure, land value, land use, and land development in some way or another. A country’s capacity may be advanced and combine all the activities in one conceptual framework supported by sophisticated ICT models. More likely, however, capacity will involve very fragmented and basically analogue approaches. Different countries will also put varying emphasis on each of the four functions, depending on their cultural basis and level of economic development. Arguably sound land governance is the key to achieve sustainable development and to support the global agenda set by adoption of the Millennium Development Goals (MDGs). Land governance is about the policies, processes and institutions by which land, property and natural resources are managed. Land governance covers all activities associated with the management of land and natural resources that are required to fulfil political and social objectives and achieve sustainable development. This includes decisions on access to land, land rights, land use, and land development. The cornerstone of modern land administration theory is the land management paradigm in which land tenure, value, use and development are considered holistically as essential and omnipresent functions performed by organised societies. Within this paradigm, each country delivers its land policy goals by using a variety of techniques and tools to manage its land and resources. What is defined as land administration within these management techniques and tools is specific to each jurisdiction, but the core ingredients, cadastres or parcel maps and registration systems, remain foundational. These ingredients are the focus of modern land administration, but they are recognised as only part of a society’s land management arrangements. The land management paradigm is illustrated in figure 7 below. 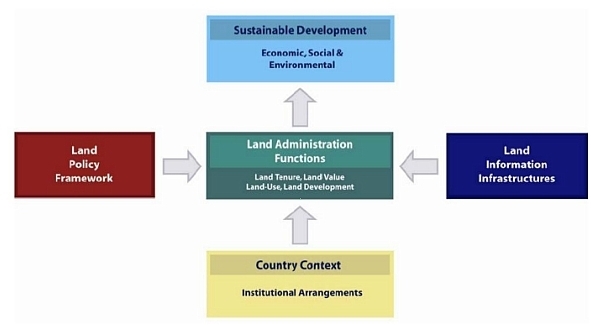 The Land management paradigm allows everyone to understand the role of the land administration functions (land tenure, land value, land use, and land development) and how land administration institutions relate to the historical circumstances of a country and its policy decisions. Importantly, the paradigm provides a framework to facilitate the processes of integrating new needs into traditionally organised systems without disturbing the fundamental security these systems provide. While sustainability goals are fairly loose, the paradigm insists that all the core land administration functions are considered holistically, and not as separate, stand-alone, exercises. Land policy is simply the set of aims and objectives set by governments for dealing with land issues. Land policy is part of the national policy on promoting objectives such as economic development, social justice and equity, and political stability. Land policies vary, but in most countries they include poverty reduction, sustainable agriculture, sustainable settlement, economic development, and equity among various groups within the society. Land management activities reflect drivers of globalization and technology. These stimulate the establishment of multifunctional information systems, incorporating diverse land rights, land use regulations, and other useful data. A third driver, sustainable development, stimulates demands for comprehensive information about environmental, social, economic, and governance conditions in combination with other land related data. The operational component of the land management paradigm is the range of land administration functions (land tenure, value, use and development) that ensure proper management of rights, restrictions, responsibilities and risks in relation to property, land and natural resources. Sound land management requires operational processes to implement land policies in comprehensive and sustainable ways. Many countries, however, tend to separate land tenure rights from land use opportunities, undermining their capacity to link planning and land use controls with land values and the operation of the land market. These problems are often compounded by poor administrative and management procedures that fail to deliver required services. Investment in new technology will only go a small way towards solving a much deeper problem: the failure to treat land and its resources as a coherent whole. 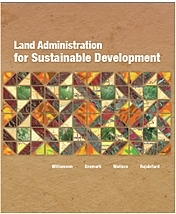 The recent book Land Administration for Sustainable Development (Williamson, Enemark, Wallace, Rajabifard, 2010) explores the capacity of the systems that administer the way people relate to land. A land administration system provides a country with the infrastructure to implement land policies and land management strategies. From the origin of the cadastre in organising land rights to the increasing importance of spatially enabled government in an ever changing world, the book emphasises the need for strong geographic and land information systems to better serve our world. The land management paradigm makes a national cadastre the engine of the entire LAS, underpinning the country’s capacity to deliver sustainable development. This is shown diagrammatically in figure 9. The diagram highlights the usefulness of the large scale cadastral map as a tool by exposing its power as the representation of the human scale of land use and how people are connected to their land. Wherever the cadastre sits in a national land administration system, ideally it should assist the functions of land tenure, value, use, and development. This way the cadastral system becomes the core technical engine delivering the capacity to control and manage land through the four land administration functions. They support business processes of tenure and value, depending on how the cadastre is locally built. They identify legal rights, where they are, the units that form the commodities and the economy related to property. These cadastres are much more than a layer of information in national SDI. The diagram is a virtual butterfly: one wing represents the cadastral processes, and the other the outcome of using the processes to implement the land management paradigm. Once the cadastral data (cadastral or legal parcels, properties, parcel identifiers, buildings, legal roads, etc.) are integrated within the SDI, the full multipurpose benefit of the LAS, so essential for sustainability, can be achieved. The body of the butterfly is the SDI, with the core cadastral information sets acting as the connecting mechanism. This additional feature of cadastral information is an additional role, adding to the traditional multipurpose of servicing the four functions. This new purpose takes the importance of cadastral information beyond the land administration framework by enlarging its capacity to service other essential functions of government, including emergency management, economic management, effective administration, community services, and many more functions. The diagram demonstrates that the cadastral information layer cannot be replaced by a different spatial information layer derived from geographic information systems (GIS). The unique cadastral capacity is to identify a parcel of land both on the ground and in the system in terms that all stakeholders can relate to, typically an address plus a systematically generated identifier (given addresses are often duplicated or are otherwise imprecise). The core cadastral information of parcels, properties and buildings, and in many cases legal roads, thus becomes the core of SDI information, feeding into utility infrastructure, hydrological, vegetation, topographical, images, and dozens of other datasets. Place matters! Everything happens somewhere. If we can understand more about the nature of “place” where things happen, and the impact on the people and assets on that location, we can plan better, manage risk better, and use our resources better (Communities and Local Government, 2008). Spatially enabled government is achieved when governments use place as the key means of organising their activities in addition to information, and when location and spatial information are available to citizens and businesses to encourage creativity. New distribution concepts such as Google Earth provide user friendly information in a very accessible way. Consider the option where spatial data from such concepts are merged with built and natural environment data. This unleashes the power of both technologies in relation to emergency response, taxation assessment, environmental monitoring and conservation, economic planning and assessment, social services planning, infrastructure planning, etc. This also include design and implementation of a suitable service oriented IT-architecture for organising spatial information that can improve the communication between administrative systems and also establish more reliable data based on the use of the original data instead of copies. The technical core of Spatially Enabling Government is the spatially enabled cadastre. “Spatially enabled society is about managing information spatially – not managing spatial information” (Williamson, 2010). The eight Millennium Development Goals (MDGs) form a blueprint agreed to by all the world’s countries and the world’s leading development institutions. The first seven goals are mutually reinforcing and are directed at reducing poverty in all its forms. The last goal - global partnership for development - is about the means to achieve the first seven. These goals are now placed at the heart of the global agenda. To track the progress in achieving the MDGs a framework of targets and indicators is developed. This framework includes 18 targets and 48 indicators enabling the on-going monitoring of the progress that is reported on annually (UN, 2000). The MDGs represent a wider concept or a vision for the future, where the contribution of the global surveying community is central and vital. This relates to the areas of providing the relevant geographic information in terms of mapping and databases of the built and natural environment, and also providing secure tenure systems, systems for land valuation, land use management and land development. These aspects are all key components within the MDGs. 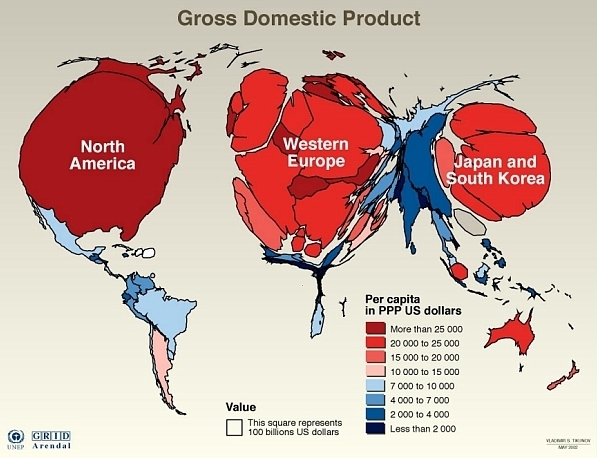 The global challenge can be displayed through a map of the world (figure 11) where the territory size shows the proportion of worldwide wealth based on the Gross Domestic Product. In surveying terms, the real challenge of the global agenda is about bringing this map back to scale. Figure 11. Map of the world where the territory size is shown based on the Gross Domestic Product. In a global perspective the areas of surveying and land administration are basically about people, politics, and places. It is about people in terms human rights, engagement and dignity; it is about politics in terms of land policies and good government; and it is about places in terms of shelter, land and natural resources (Enemark, 2006). Land administration is addressing societal needs. In Western cultures it would be hard to imagine a society without having property rights as a basic driver for development and economic growth. In most developing countries, however, about 70% of the land is outside the formal land administration system. Furthermore, land administration should also address the key challenges of the new millennium such as climate change, natural disasters, and rapid urban growth. The key challenges of the new millennium are clearly listed already. They relate to climate change; food shortage; urban growth; environmental degradation; and natural disasters. These issues all relate to governance and management of land. Land governance is a cross cutting activity that will confront all traditional “silo-organised” land administration systems. (Enemark, 2009). The challenges of food shortage, environmental degradation and natural disasters are to a large extent caused by the overarching challenge of climate change, while the rapid urbanisation is a general trend that in itself has a significant impact on climate change. Measures for adaptation to climate change must be integrated into strategies for poverty reduction to ensure sustainable development and for meeting the MDGs. Adaptation to and mitigation of climate change, by their very nature, challenge governments and professionals in the fields of land use, land management, land reform, land tenure and land administration to incorporate climate change issues into their land policies, land policy instruments and facilitating land tools. More generally, sustainable land administration systems should serve as a basis for climate change adaptation and mitigation as well prevention and management natural disasters. The management of natural disasters resulting from climate change can also be enhanced through building and maintenance of appropriate land administration systems. Climate change increases the risks of climate-related disasters, which cause the loss of lives and livelihoods, and weaken the resilience of vulnerable ecosystems and societies. Adaptation to climate change can be achieved to a large extent through building sustainable and spatially enabled land administration systems. This should enable control of access to land as well as control of the use of land. Such integrated land administration systems should include the perspective of possible future climate change and any consequent natural disasters. The systems should identify all prone areas subject to sea-level rise, drought, flooding, fires, etc. as well as measures and regulations to prevent the impact of predicted climate change. Key policy issues to be addressed should relate to protecting the citizens by avoiding concentration of population in vulnerable areas and improving resilience of existing ecosystems to cope with the impact of future climate change. Building codes may be essential in some areas to avoid damage e.g. in relation to flooding and earthquakes. Issues may also relate to plans for replacement existing settlements as an answer to climate change impacts. 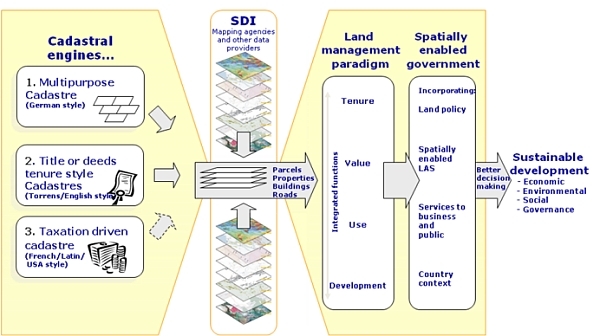 The measures of building integrated and spatially enabled land information systems does not necessarily relate to the inequity between the developed and less developed countries. Implementation of such systems will benefit all countries throughout the globe. Therefore, the integrated land administration systems should, in addition to appropriate registration of land tenure and cadastral geometry, include additional information that is required about environmental rating of buildings, energy use, and current and potential land use related to carbon stock potential and greenhouse gases emissions. This also relates to the fact that climate change is not a geographical local problem that can be solved by local or regional efforts alone. To address climate change, international efforts must integrate with local, national, and regional abilities. Urbanisation is another major change that is taking place globally. The urban global tipping point was reached in 2007 when over half of the world’s population was living in urban areas; around 3.3 billion people. This incredibly rapid growth of megacities (more than 10 million inhabitants) causes severe ecological, economic and social problems. It is increasingly difficult to manage this growth in a sustainable way. It is recognised that over 70% of the growth currently happens outside of the formal planning process and that 30% of urban populations in developing countries living in slums or informal settlements, i.e. where vacant state-owned or private land is occupied illegally and used for illegal slum housing. In sub-Saharan Africa, 90% of all new urban settlements are taking the form of slums. These are especially vulnerable to climate change impacts as they are usually built on hazardous sites in high-risk locations. Even in developed countries unplanned or informal urban development is a major issue (FIG/WB 2010). Urbanisation is also having a very significant impact on climate change. The 20 largest cities consume 80% of the world’s energy use and urban areas generate 80% of greenhouse gas emissions world-wide. Cities are where climate change measures will either succeed or fail. Rapid urbanisation is setting the greatest test for Land Professionals in the application of land governance to support and achieve the MDGs. The challenge is to deal with the social, economic and environment consequences of this development through more effective and comprehensive spatial and urban planning, resolving issues such as the resulting climate change, insecurity, energy scarcity, environmental pollution, infrastructure chaos and extreme poverty. In conclusion, the linkage between urban growth, climate change adaptation, and sustainable development should be self-evident. Measures to manage urban growth and for adaptation to climate change will need to be integrated into strategies for poverty reduction to ensure sustainable development. The land management perspective and the role of the operational component of land administration systems therefore need high-level political support and recognition. The role surveyors are changing. In a global perspective there is a big swing that could be entitled “From Measurement to Management”. This does not imply that measurement is no longer a relevant discipline to surveying. The change is mainly in response to technology development. Collection of data is now easier, while assessment, interpretation and management of data still require highly skilled professionals. The role is changing into managing the measurements. There is wisdom in the saying that “All good coordination begins with good coordinates” and the surveyors are the key providers. The concept of a modern Positioning Infrastructure (combining satellites and reference stations on the ground) still supports the activities traditionally associated with a geodetic datum but extends toward much broader roles on the global scale. It can be argued that GNSS could be considered one of the only true global infrastructures in that the base level of quality and accessibility is constant across the globe (Higgins, 2009). Such a Positioning Infrastructure moves the focus from measurement of framework points to management of the data received from the positioning system. The change from measurement to management also means that surveyors increasingly contribute to building sustainable societies as experts in managing land and properties. The surveyors play a key role in supporting an efficient land market and also effective land-use management. These functions underpin development and innovation for social justice, economic growth, and environmental sustainability. The big swing is implies a change from land surveyors to land professionals. FIG is an UN recognised NGO representing the surveying profession in about 100 countries throughout the world. FIG has adopted an overall theme for the current period of office (2007-2010) entitled “Building the Capacity”. This theme applies to the need for capacity building in developing countries to meet the challenges of fighting poverty and developing a basis for a sustainable future, and, at the same time, capacity is needed in developed countries to meet the challenges of the future in terms of institutional and organisational development in the areas of surveying and land administration. Professional development: FIG provides a global forum for discussion and exchange of experiences and new developments between member countries and between individual professionals in the broad areas of surveying and mapping, spatial information management, and land management. This relates to the FIG annual conferences, the FIG regional conferences, and the work of the ten technical commissions within their working groups and commission seminars. This global forum offers opportunities to take part in the development of many aspects of surveying practice and the various disciplines including ethics, standards, education and training, and a whole range of professional areas. Institutional development: FIG supports building the capacity of national mapping and cadastral agencies, national surveying associations and survey companies to meet the challenges of the future. FIG also provides institutional support to individual member countries or regions with regard to developing the basic capacity in terms of educational programs and professional organisations. The professional organisations must include the basic mechanisms for professional development including standards, ethics and professional code of conduct for serving the clients. Global development: FIG also provides a global forum for institutional development through cooperation with international NGO´s such as the United Nations Agencies (UNDP, UNEP, FAO, HABITAT), the World Bank, and sister organisations (GSDI, IAG, ICA, IHO, and ISPRS). The cooperation includes a whole range of activities such as joint projects (e.g. The Bathurst Declaration, The Aguascalientes Statement), and joint policy making e.g. through round tables. This should lead to joint efforts of addressing topical issues on the international political agenda, such as reduction of poverty and enforcement of sustainable development. FIG, this way, intends to play a strong role in improving the capacity to design, build and manage surveying and land management systems that incorporate sustainable land policies and efficient spatial data infrastructures. These systems should also respond to the global agenda in terms of the Millennium Development Goals and the new key challenges in terms of climate change, natural disasters, and urban growth. 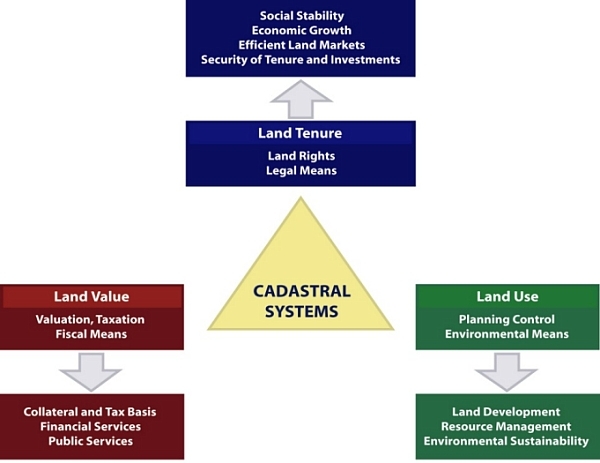 Cadastral Systems underpin efficient management of the four key functions within the land management paradigm. And the large scale cadastral map is a key tool in providing the representation of the human scale of land use and how people are connected to their land. The role of cadastral systems has evolved over time from primarily serving as a basis for land taxation and/or security of land tenure towards being the key driver for achieving good governance of land and natural resources in support of national policies and the global agenda. Over the last decades FIG and the global surveying community has taken a leading role in driving this evolution. Sound land governance is the key to achieve sustainable development and to support the global agenda set by adoption of the Millennium Development Goals. FIG, this way, is building the capacity for taking the land policy agenda forward in a partnership with the UN agencies and the World Bank. This is documented in recent publications such as: “Land Governance in Support of the Global Agenda” (FIG/WB, 2010) and “Innovations in Land Rights Recognition, Administration and Governance” (WB/GLTN/FIG/FAO (2010). De Soto, H. (1993): The Missing Ingredient. The Economist, September 1993, pp. 8-10. Enemark, S. (2009): Spatial Enablement and the Response to Climate Change and the Millennium Development Goals. Proceedings of the 18th UN Regional Cartographic Conference for Asia and the Pacific, Bangkok, 26-30 October 2009. FIG Publications, FIG Office, Copenhagen, Denmark. Steudler, D., Williamson, I., Rajabifard, A., and Enemark, S. (2004): The Cadastral Template Project. Proceedings of FIG Working Week 2004, Athens, 22-27 May. 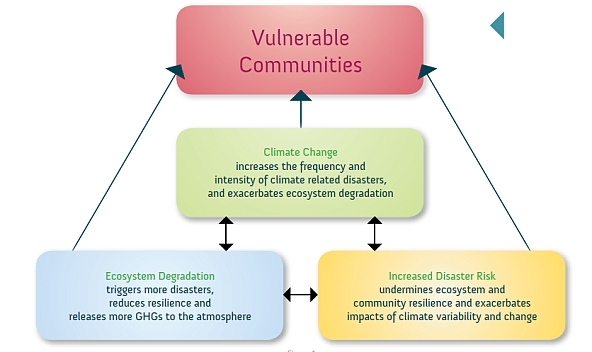 15 p.
UNEP (2009): The Role of Ecosystem management in Climate Change Adaptation and Disaster Risk Reduction. Copenhagen Discussion Series. UN-HABITAT (2003): Handbook on Best practices, Security of Tenure and Access to Land. ISBN: 92-1-131446-1. UN-Habitat, Nairobi. UN-HABITAT (2008): Secure Land Rights for all. UN Habitat, Global Land Tools Network. WB/GLTN/GLTN/FAO (2010): Innovations in Land Rights Recognition, Administration and Governance”. World Bank, Washington D.C.
Williamson, I. and L. Ting (1999): Cadastral Trends. Proceedings of FIG Commission 7, FIG Working Week, Sun City, South Africa, June 1999, pp. 1-19. Stig Enemark is President of the International Federation of Surveyors, FIG 2007-2010. He is Professor in Land Management and Problem Based Learning at Aalborg University, Denmark, where he was Head of School of Surveying and Planning 1991-2005. He is a well-known international expert in the areas of land administration systems, land management and spatial planning, and related educational and capacity building issues. He has published widely in these areas and undertaken consultancies for the World Bank and the European Union in a range of countries in Asia, Eastern Europe, and Sub Saharan Africa.